Bakewell is a highly picturesque market town that crosses the River Wye and lies right in the heart of the Peak District National Park. 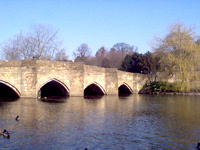 Bakewell dates back to Saxon times and of course is home to the famous Bakewell pudding. Bakewell earns a mention in the Domesday Book, calling the town ‘Badequella’, meaning Bath-Well, referring to the warm springs of the area. In 924, under the rule of Edward the Elder, the Saxons ordered a fortified borough to be built . The church originates from 920 and stands high on the hillside where the town originally started. It has both Norman and Saxon stonework but belongs more to its 13th century rebuild as well as the extensive renovation undergone in the 1840’s. The church holds many monuments including those to the Vernon family, who owned the town of Bakewell from 1502 before passing it on to the Manners family in 1567. Other notable places to visit include the Old House Museum, the Old Town Hall and the Rutland Arms Hotel, where Jane Austen is said to have stayed around 1811, and which she mentioned in her novel, Pride and Prejudice. There is a wide variety of shops, pubs, restaurants and places to stay in and around the town and plenty of places that you can buy the famous Bakewell pudding.